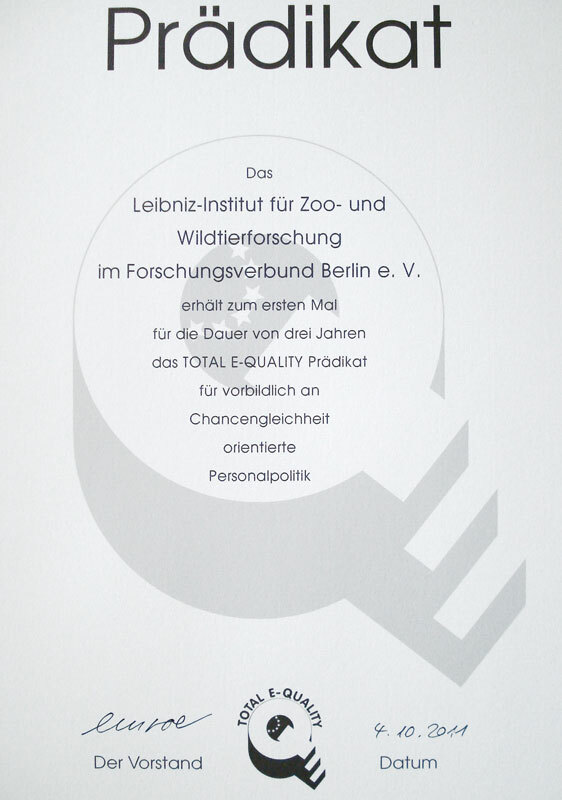 Gender equality - IZW Leibniz Institute for Zoo and Wildlife Research in the Forschungsverbund Berlin e. V.
In 2008 the Leibniz Association, as first of the non-university science organisations, enacted the “Research-oriented standards on gender equality” of the Deutsche Forschungsgemeinschaft in its constitution to warrant equal opportunities for women and men. One particular goal is to improve career access, advancement and conditions for women to ensure a gender balance in leadership positions. The IZW is strongly committed to the goals of gender equality and the work-life-balance of its employees. In the past ten years the IZW achieved a balanced gender proportion in its leadership positions. In 2011 a working group comprising members of all levels of staff was established and headed by the institute’s representatives for gender equality. The group discussed and challenged a range of aspects of gender equality concerning the IZW. The results of these efforts are implemented in a novel obligatory operating agreement of the IZW and reflected in the institute's successful application for the “Total E-Quality“ certification in 2011. In 2014, this title has been awarded a second time to the IZW. The institute has fulfilled and exceeds the requirements of the gender quota model currently in operation. Future efforts will focus on enhancing support for staff with young children or family members in need of care. As a first step a new child-parent office room was created for parents requiring ad hoc child care.